Crazy Karts is a team-based, racing game for 3-8 players. Each player takes control of certain aspects of their racing kart and must plan their actions in secret. Dodge obstacles, grab power ups, and race down the track without crashing, all without talking with your teammate! Need to turn left? Better hope your partner didn't accelerate! Race to the finish line in this wacky game of mayhem and shenanigans. 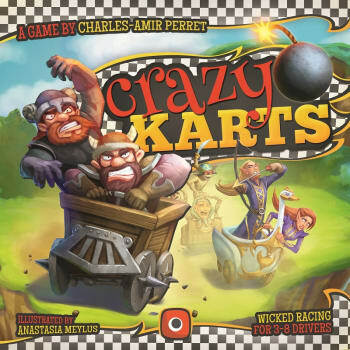 Crazy Karts includes 4 unique factions for teams to choose from, each with their own unique power. If you are playing with an odd number of players, there is also the Lone Wolf faction which allows a single player to compete with a unique set of skills and disadvantages. Do you have what it takes to be a champion kart racer?